And here it becomes apparent that common intentions are as apples dropped by habit, and by patient accumulation also. Even a wild parent will at times determine how far new wants shall be entertained. I will here only allude to the successive variations bursting forth from the tree of industry; such facts are of plain signification. I am thoroughly convinced, and yet by some monstrosity still I presume to doubt. We have witnessed considerable deviation, but so many causes tend to obscure this result. In the spectre of great hostile camps, ensconced on stolen land, we continue to replace old wants. Whose habits must at all times be accounted for? How entirely vague are the considerable deviations we find through the opening of that wide door labelled “Conjecture.” Not for the first time, I was much struck. My Reveries of a Solitary Biker recycle notes taken from 2013 to 2017 while I was completing a master of arts in Graduate Liberal Studies at Simon Fraser University, and as I biked around the city at that time. During the course of these rides, my mind would wander, sometimes working through particular aspects of whatever I’d been reading, sometimes fixing on more mundane matters. As I rode, I composed by repeating particular lines or phrases over and over under my breath to the rhythm of my riding until they sounded right. Sometimes I would stop to jot down a few pertinent phrases, or what struck me as an interesting combination of words, just enough for me later to reconstruct what I was thinking. I combined these “riding notes” with notes I took while reading, so that my final poems use both my wandering biking thoughts and my readings as source material, just as Rousseau’s Reveries use his walking meditations as the basis for his ten beautifully constructed “Walks.” In homage to the playing-card origins of Rousseau’s Reveries, my Reveries originally were divided into four suits and printed as a deck of cards, in a design by artist Kelly Haydon. The playing-card poems were set to music by my frequent collaborator, clarinetist François Houle; together we can perform the piece by asking audience members to draw some of the cards from the deck; the poems and music are then presented in the order drawn. Each performance is thus distinct, incomplete, and inconclusive. 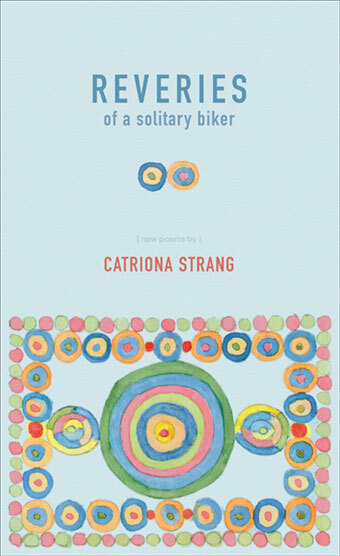 The poems in Strang’s Reveries move through meditation, and the sections appear to be structured as much around rhythm as content, holding a suite of, for example, mishaps, discord and destruction in her “Diamonds” section, perhaps utilizing the section-titles to suggest, or even trigger, into a particular series of directions. Part of what appeals about her structure is in understanding, even from her perspective, how seemingly arbitrary the order of the poems actually is, opening up to the possibility of performing or reading in an entirely different sequence; the downside to the printed book is that it holds the sequence in a single order, what in the 1960s or 70s, possibly, via Coach House, might have actually been produced as a deck of playing cards, thus opening up the possibility of multiple orders, readings and understandings. It was a beautiful mishap. Who could have imagined that I would be anything but receptive? From now on, we will express value in numbers of floors swept. As the foregoing analysis should already have demonstrated, I have long been mystified by the multitude of signs advertising “self storage”: I dare you to bike my ride. Nor is this all; having yet to rust, we bid farewell to the deadly ideologue, as once we bid farewell to our taste for subsumption. It’s a dark matter, and I reserve the right to chain my mind. Yet again, we are all collateral damage. A: I was visiting my friends Louis Cabri and Nicole Marcotić last summer here in Vancouver, saw a copy of Chapman’s Homer lying around, and made a weak joke about how I should write “On Not Looking Into Chapman’s Homer”. And then I did. At the time I was reading quite a lot about caring labour and its continued invisibility, and about value and value-formation, which I used in the piece. I also bike around Vancouver a lot, and often check our network of book exchanges while doing so. I love book exchanges, and got a city grant to put one up on our street, which our neighbour, the sculptor Juga Kitanovic, built. I think it’s the most wonderful book exchange in town. I can send you a picture if you like. Anyway, I’ve found some great stuff in book exchanges over the years, including books on women’s labour in the 19th century and lots of weird old recipe pamphlets with wonderful mid-century graphics. I've been wanting to do something with them for ages. “On Not Looking” is what happened when I combined those book exchange finds with my reading on caring labour and value. Q: How does this compare to the other work you’ve been doing lately? A: It’s a continuation of the work I’ve been doing lately; in fact, it’s the epilogue to a larger work entitled Reveries of a Solitary Biker, a response to Jean-Jacques Rousseau’s Reveries of the Solitary Walker in the form of a deck of cards set to music, which was published by Talon last fall. I think “Chapman’s Homer” is less sparse and more direct than the rest of my Reveries poems, though, but like them it is also directly related to my experiences as a care provider, whose work is for the most part invisible and undervalued, even by me. CBC Literary Contest : Poetry : LONGLIST!